Crafts from the farm in Diggers Valley. 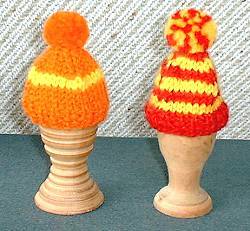 and hats and other knitted garments by Ruth. Some of Magda Cotman's Pottery featured in July 2004. Stephan learned to turn wood many years ago, but has only recently had the opportunity to take up that hobby again, to his great delight. He is experimenting with all sorts of woods, some milled from fallen trees on the farm. 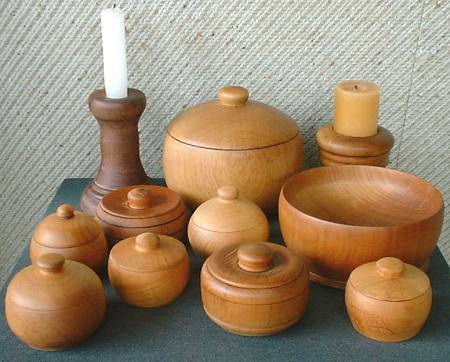 His current speciality is turning lidded trinket boxes of various sizes, which are finished with only the application of oil and/or furniture polish and generally felt-lined to provide a soft recepticle for whatever trinkets the boxes may be required to contain. and may be purchased for NZ$40.00 plus p&p. Any other garment may be knitted by arrangement, in either wool or cotton yarn. That special present for the person who still enjoys a boiled egg, a wood-turned egg-cup and hand-knitted egg-hat. NZ$20.00 plus p&p.